US-supported ISIS and other terrorists were caught red-handed using sarin and other chemical weapons against civilians in Syria numerous times – Assad wrongfully blamed for their crimes. No evidence suggests his forces used them at any time throughout the conflict. Plenty shows CIA and US special forces train takfiri terrorists in chemical weapons use, perhaps supplying them with toxic agents to use. Mustard gas is a cytotoxic blistering agent, causing debilitating, potential lethal, internal and external chemical burns, affecting exposed skin and lungs when inhaled, able to penetrate wool and cotton fabrics. The delayed effect is a characteristic of mustard agent. Mustard agent gives no immediate symptoms upon contact and consequently a delay of between two and twenty-four hours may occur before pain is felt and the victim becomes aware of what has happened. By then cell damage has already been caused. The 1972 Biological Weapons Convention and 1993 Chemical Weapons Conventions prohibit their production, storage or transfer. 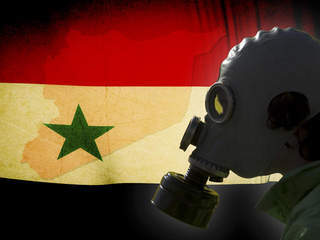 It was said that the terrorists were going to use mustard gas ammo against government forces of President Bashar Assad. The Syrian American Medical Society reported city of Marea civilian areas attacked with over 50 shells containing toxic agents. Symptoms showed chemical exposure. Some victims had blisters associated with mustard gas use. So-called rebels said shells were fired from an ISIS controlled area. Kurdish forces in northern Syria and Iraq were attacked with toxic chemical agents. Many injuries were reported. ISIS was blamed in both countries. On November 23, an OPCW Executive Council special session will be held to discuss its findings of chemical weapons use in Syria. The organization last year said Assad completed handing over his government’s entire CW stockpile in June 2014. Toxic chemical agents in the hands of ISIS and/or other terrorist groups pose dangers throughout the region and beyond.